One should equate Jamaica to the friendly smiles of the local people, the splendid beaches which are ideal for romance and the clear and sunny Caribbean sunshine! Jamaica is blessed with the natural beauty and has ever rolling green hills and valleys right in the center of the island, with the lush green jungles and a rich flora with a veritable rainbow of flowering trees and plants. This is the reason that Jamaica has won the prestigious World Travel Award, for “The Best Caribbean Destination” on several occasions. The island takes pride in the array of outdoor adventures, romantic escapades, and resort experiences that she offers to her guests. Whether you are visiting Jamaica for the first time or coming back again, there is a wide choice of distinct experiences to thrill and excite you. Exploring the island and discovering your own favorite spots is a thrilling experience it. There is no doubt that Jamaica is one of the most beautiful Caribbean hotspots and an ideal place for those looking out for a perfect vacation with lots of sun, sand and fun! Jamaica as a Honeymoon Destination is a special experience with the beautiful, luxurious and the best travel services. The more popular honeymoon spots are in the Blue Mountains, the Black River, and the Cave Valley, not forgetting the romantic beaches, with a lot of entertaining and relaxing activities. Whether it is the beach, the history or the culture, Jamaica honeymoons will leave you with unforgettable memories. The three main beaches in Jamaica – Montego Bay, Negril, and Ocho Rios are all perfect and idyllic locations for honeymoon vacations and has accommodation in luxurious beach house villas and resorts with great nightlife and shopping opportunities. There are plenty of resort towns in Jamaica the island which will satisfy all your vacation dreams and at the same time, suit your budget too. There are plenty of exciting things to do in Jamaica from a quiet and relaxing vacation to an active, fun-filled and thrilling adventurous one! 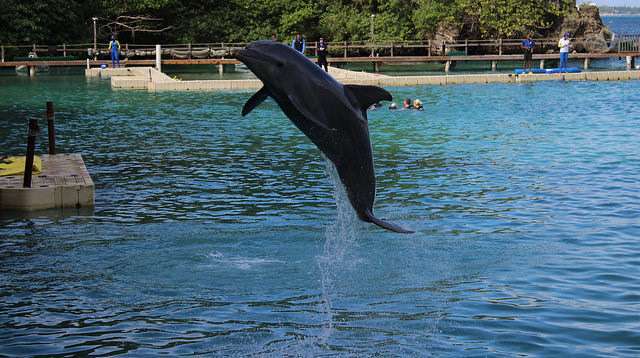 Excursions, sightseeing tours and the most fascinating – the above and below the water activities are just waiting to be experienced and enjoyed.The Dolphin Cove at Treasure Reef is one of the most sought after highlights in Jamaica and is located in the town of Ocho Rios. You get the unique opportunity to get into the water and be in close contact with the dolphins – the ocean’s most intelligent creatures! It is just amazing to be so near them and stroke their smooth skin and get kissed with them – a truly amazing and thrilling experience that will be a lifelong memory. Deep Sea Fishing is another popular water sport in Jamaica which can be arranged from many places. The closest to Silver Sands is the marina at Glistering Waters, which is located mid-way between the town of Falmouth and the Trelawny Beach Hotel in Ocho Rios. Jamaica is the host to several annual blue marlin tournaments which attract anglers from all over the globe. Fishers can catch the blue and white marlin, tuna and dolphin here.Scuba Diving is a not-to-be-missed activity while in Jamaica. Beginners can take advantage of The PADI Discover Scuba Diving course which is a great introduction to this popular water sport. The crystal-clear blue waters of the Caribbean with its beautiful coral reefs and fascinating marine life with schools of colorful tropical fish and other underwater habitats make scuba diving an “out of this world” experience. You can find the best spot for scuba diving in the town of Negril, which offers a wide choice of dive sites that are ideally suited for all levels – from coral formations to wrecks and caves. The other options for land and water activities that you can indulge in are swimming in the Blue Lagoon, hiking and trekking tours, playing golf, shopping in the big and small Jamaican shops or just relaxing on any of the lovely beaches. If you are planning a wedding or a honeymoon or just a family vacation head to this glorious romantic Caribbean island of Jamaica – the country with its sea-green beaches, its vibrant history and colorful culture, the amazing waterfalls and its ever enticing tropical beauty! Beautiful, calm, tranquil. Jamaica is on my list of places to visit. I love your pictures. Thanks…Yes Jamaica is Really Beautiful & You Should Visit it Once….